Republicans are once again cranking up the heat on Hillary Clinton for her use of a private email account while she served as secretary of state. In the latest round of attacks, GOP members are working to capitalize on a House committee investigating the all-but-declared presidential candidate. Republican National Committee Chairman Reince Priebus accused Clinton of potential “criminal conduct” on Sunday, after House Select Committee on Benghazi Chairman Trey Gowdy charged the former secretary of state with wiping clean the private email server she used as America’s top diplomat. “I mean this is intentional behavior, which in many cases, Steve, is criminal in nature,” Priebus said Sunday to Fox News host Steve Doocy. In an earlier statement, Priebus compared Clinton to former president Richard Nixon, who installed a secret recording system in the White House. “Even Nixon didn’t destroy the tapes,” Priebus said. Republicans have been hammering Clinton for weeks for exclusively using a personal email account while she served as secretary of state, something Clinton later acknowledged in a press conference was probably a mistake. On Friday, Clinton lawyer David Kendall responded to a subpoena from Gowdy by saying that Clinton had already turned over all the emails the congressman sought, adding that Clinton permanently deleted personal emails left on her server. That led Gowdy to accuse Clinton of trying to hide emails from federal recordkeepers. Gowdy has been careful to try to avoid politicizing his investigation as much as possible, but the prospect of going after Clinton has been difficult for party officials to resist. 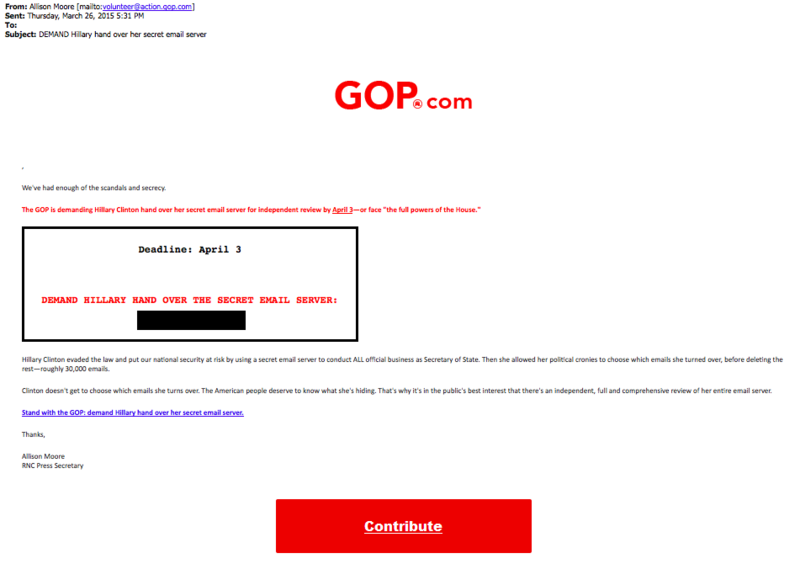 Thursday evening, the RNC sent an email to supporters that included a contribution button and urged supporters to sign a petition to “Stand with the GOP: Demand Hillary Hand Over the Secret Email Server. “The GOP is demanding Hillary Clinton hand over her secret email server for independent review by April 3 — or face ‘the full powers of the House,’” the email to sent Thursday night reads. The ultimatum is a reference to a similar one Gowdy made in a letter to Clinton this month, though the RNC cannot direct House Republicans to take action, as some reading the email might assume. While the petition page does did not ask for a donation, politicians often use petitions to collect email addresses that can later be used for fundraising purposes. Gowdy has spoken out against Republican attempts to raise money off his investigation into the 2012 terror attacks, and pulled out of a fundraiser for the Virginia Republican Party this month when he discovered it focused on Benghazi. “There are still, even in a culture of hyper partisanship, certain things that ought to be above politics, like the murder of four fellow Americans,” he told MSNBC’s “Morning Joe” in May. Despite the withering attacks on her email usage, Clinton advisers feel they turned a corner on the email controversy when it became a partisan fight about the Benghazi attacks — and not a fight between her and the press.